Disney's Yacht Club Resort has a nautical theme, and is located within walking distance of both Epcot and Hollywood Studios. Yesterday, I took a walk to this hotel from World Showcase. 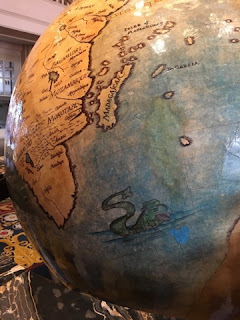 This globe sits in the middle of the lobby. If you look closely, you will see a blue, classic "hidden Mickey" toward the bottom right.